Nowadays, HBO’s hit show Game of Thrones is the toast of the medieval enthusiast world. Featuring great pieces of authentic medieval jewelry and fashion and realistic battles, Game of Thrones is one of the most popular shows on television now. It isn’t, however, the first series to showcase the lush world of the medieval period. Here’s a look back at some medieval shows from TV’s past. ThunderCats (1985) – Sure, this one is a little out of left field, but its combination of science fiction and alternate-history medieval time period has made this cartoon a favorite among medieval fans, many of whom were first exposed to the medieval era through this show. 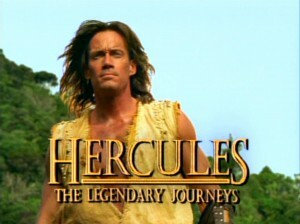 Hercules: The Legendary Journeys (1995) – This wildly popular show featured Kevin Sorbo as a swashbuckling Hercules. This show also featured Bruce Campbell, already a favorite in the medieval fan community for his role in the film, Army of Darkness. Hercules: The Legendary Journeys led to the equally successful spin-off, Xena: Warrior Princess. The Tudors (2007) – One of the only medieval-set shows without a magical or fantasy component, this show chronicled the reign of King Henry VIII of England. After lasting only four seasons, this show proved to be extremely popular, spawning new interest in historical fiction. Gargoyles (1994) – Another cartoon, this one is particularly notable due to its many Shakespearean themes, complex characters, and Scottish mythology. There aren’t many kids’ shows that can boast that! What are some of your favorite medieval TV shows? We’d love to hear about them. Let us know in the comment section! 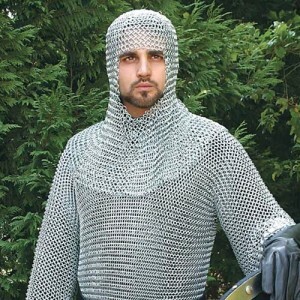 One of the first medieval items anyone thinks of when imagining the Middle Ages is chainmail armor. The iconic metal rings were designed to protect the knights in the heat of combat, but have since become synonymous with chivalry, knighthood, and the Dark Ages. Pearson’s offers chainmail shirts, coifs, vests and gauntlets. We have blackened chainmail pieces, and mail made from plated brass and riveted aluminum. Chainmail Armor seems to have been first created by the Celts. Seeing its value after battling with the Celts, the Romans adopted the idea of interlocking iron, steel, or brass rings together to protect the soldier within. Swords and spears did not easily pass through the material and many lives were saved because of it. Even when plate mail overtook chainmail as a popular source of outerwear for battle, many knights kept their chainmail beneath the plate armor. It provided extra protection to joints and sensitive areas, and was more accessible than the expensive plate armor. Until the widespread use of gunpowder on the battlefield, chainmail was the best protection a soldier could wear. Pearson’s carries real chain mail: interlocked metal rings. We sell not a cheap imitation, but the real thing! Make your LARP experience more authentic or create the perfect Halloween costume this year using authentic chainmail armor. We’re sure you’ll enjoy wearing the metal mesh because it provides a true experience of warrior life in the Dark Ages. She’s read about them in her storybooks and seen them in movies. Your little girl is your princess, so why not let her dress as one? 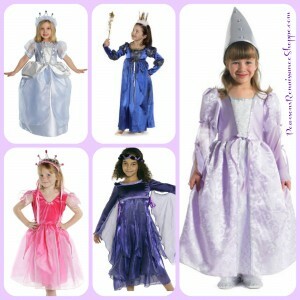 Our girls’ princess costumes are high quality and yet affordable enough to make a great present for any little lady! With gowns made from satin, velvet, and gold or silver mesh, your young princess will be sure to get all the attention that she craves from her family and friends. Puffed up sleeves and a long skirt make your little one into the heir to a medieval throne. And the metallic trim lets you know she’s royalty in the making. We offer a variety of children’s princess costumes, from the iconic pointed hat and lilac gown, to the airy princess organza dress that’s ideal for shimmering in the warm weather. We also have the accessories that every little princess needs, including tiaras, butterfly halos, glitter wings, and capes. While princess costumes may excite many girls, others have different tastes. Our children’s tartan dresses, gowns, bodices, robes, fairy costumes, and more ensure that your little girl will find the clothing for the character she most wants to play. 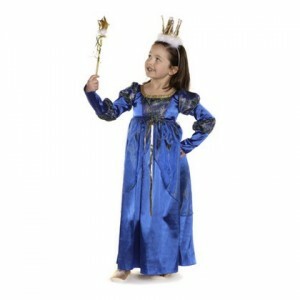 Whether she prefers Maid Marian, Rapunzel, or Lady Guinevere, our girls’ princess costumes unlock the imagination of little girls and warm the hearts of their families. The history of the medieval crown, or the practice of decorating the head of a leader, is not unique to the Middle Ages. Adorning a noble person’s head with a symbol of their lofty status extends far back into antiquity. Early, less ornate, versions of crowns – called diadems – were popular in ancient Egypt, Greece, and other Mediterranean civilizations, including the Persians. The medieval crown we would recognize today originated in England where kings were presented with an ornamental helmet as a symbol of their sovereignty. As time passed, embellishments were added to the crown, including its distinctive ornaments and arches, and the incorporation of precious jewels to the crowns of Europe. Crowns were often the symbol of monarchies and empires as the centuries passed. In the twenty-first century, crowned monarchs have become rare. The medieval crowns that once commanded supreme authority still evoke awe and wonder today in the museums and cathedrals where they are kept on public display. The crown jewels and golden ornamentation of these antique treasures is just as powerful in our times of technological prowess as they were in the Dark Ages. 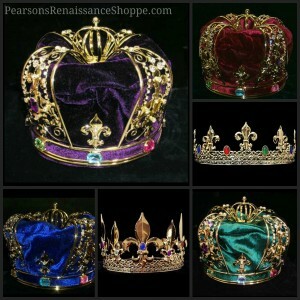 Add a medieval crown from PearsonsRenaissanceShoppe.com to your wardrobe and adopt the grandeur and royal airs of the monarchs! While some medieval clothing is better left in the Dark Ages for everyday wear, there’s plenty of medieval fashion that we’d love to see made popular again. For instance, Hollywood stars and your party friends alike would look great and have more fun in a capitano hat than in their regular baseball caps! Today, extravagant dresses are reserved for formal occasions, and not often worn as women go about their daily business. 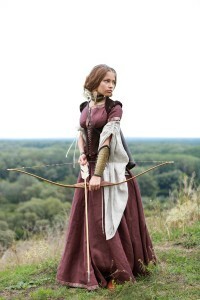 But we would love to see flowing dresses in the medieval fashion style come back into the mainstream. In the modern “less is more” clothing industry, models are chosen for their body style rather than their grace and elegance. Bringing back medieval fashion would go some way toward redressing that balance. While we’re not likely to be wearing bodices and chain mail every day, both women and men could use a return to the capes and cloaks of old days. Staying warm and looking fashionable in a cape or cloak is much more formal and eye-catching than the pea coats and jackets we wear today. 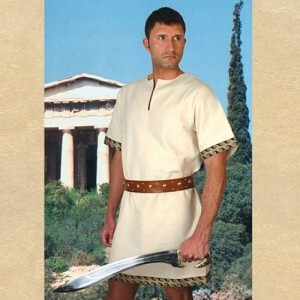 Perhaps it’s time to return to a grander, epic style of clothing than the minimalism of many of our modern fashionistas. 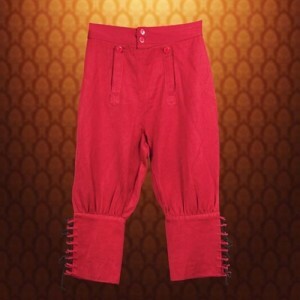 Now you know some of our favorite medieval fashion pieces that we’ d like to see return, maybe even with a modern twist. 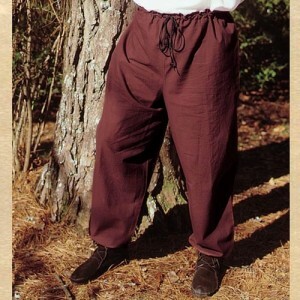 What are some articles of clothing from the Middle Ages that you’d like to see return to fashion? 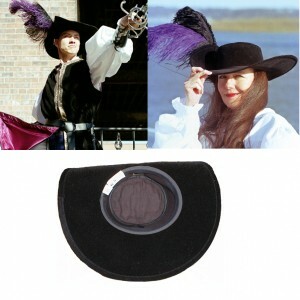 Welcome Spring with Some New Renaissance Wear! While I hold Fall close in my heart as my favorite season, that doesn’t diminish my love for Spring in the least! When Fall arrives, it is a much-needed time for winding down after the busy summer. It is a time for long walks on cool nights, savored cups of cocoa, and snuggling up with a good book and a good dog. Spring, on the other hand, is quite the opposite! Following a long winter of scraping the car windows every morning, the sun setting before we’ve left the office, and wrapping ourselves in so many layers we barely know where our clothes end and our bodies begin, Spring is a time to shake off all that slowed us down and get moving! And as good as the break Fall brings feels after a long, hot summer, Spring feels just as fantastically invigorating after a long, cold winter. One of the first things many of us do when Spring arrives is tackle the closet. It’s the perfect place to start our Spring cleaning, and tucking away heavy sweaters while breaking out much lighter pieces feels almost therapeutic. When we have all our drawers and closets emptied, it’s the perfect time to take stock of what pieces we might be ready to donate, what pieces we definitely want to keep, and what pieces we want to add or replace. If you find that some of your Renaissance costumes are looking a bit worse for wear, think of what you might want to treat yourself to. After all, don’t you deserve something special after all the hard work of cleaning your closet? We think so! From the Screen to the Backyard: Get Your Kids Off the Couch with LARPing! If you are like most modern day parents, you often find yourself in a conundrum over how much time your kids spend playing video games, computer games, and even games on their phones. It’s simple for an outsider to say, ‘Take them away!’, or ‘Limit them to 30 minutes a day!’, but taking them away and placing strict limits are often easier said than done. For one, you might be an avid gamer yourself. Telling your kids not to do something that you do can end in a yelling match for sure! For another, denying our children of something they enjoy isn’t at the top of the list of fun things about being a parent. Sometimes the hours of ‘screen time’ kids clock can slip to the bottom of our list of worries given all the other important things we have to keep on top of. But, we have a silver lining to the cloud of turning off the games! And it’s as good for you as it is for your children. Now that most of us will be savoring an extra hour of daylight it is easier than ever to plan outdoor family activities for the evenings. The days will be growing continually longer, and the weather continually milder, and that gives us an awesome opportunity to give electronics a rest while we head outside. If you don’t have a backyard at home, you can always pack the family up for a trip to the park or even a nearby field. As for what to do once you’re there? Act out your favorite video games, computer games, and phone games, of course! Yes, the family that LARPs together creates some wonderful memories together. Just be sure to keep things safe and fun, and incorporate the interests of all your children. If that means you’ll be holding a Sesame Street LARP once in awhile, or a LARP that reflects characters from their favorite book or story, so be it! When the kiddos are smiling, it’s hard not to smile right along with them. In addition to getting your kids and yourself away from the glare of the screen for a bit, having fun together as a family can also bring health benefits. You’ll be moving around, laughing, and breathing fresh air. Undistracted by constant messages from other users in a game, you can clear your mind and hit the virtual ‘refresh’ button in your brain. You’ll be making memories together, exercising together, learning more about one another, and reinforcing the importance of relying on one another and enjoying each other’s company. Renaissance Dresses Help You Literally Dress the Part! Whether you enjoy spending time at Renaissance faires or fan cons, or just need a costume for a party, there’s something terrifically transformative about slipping on a Renaissance dress! The rich fabrics and feminine shapes take you out of your workaday world and let you travel to another time and place. Renaissance dresses make it easy to take on a deliciously evil persona if you choose. With the Bellatrix Lestrange Dress or Empire Woman’s Steampunk Gown, you can show the Renaissance gentlemen around you that you’re no one to be trifled with! If deliciously evil isn’t your idea of a good time, there are plenty of Renaissance dresses to express your sweet, virtuous side as well. It’s hard to feel anything but lovely in the Bella Abita Renaissance gown. With soft layers and an embroidered bodice, you’re primed to portray that Renaissance country lass with a heart of gold. Pair it with a silk veil and you can be anything from a princess to the local smith’s daughter. For an even sweeter persona, there’s the Medieval Lace Dress. It doesn’t get much more softly feminine than flowing white lace and a fitted bodice. Dress it up with jewels and a crown or let it be your medieval wedding gown. Just be sure to hurry – this one is on clearance! If you’re looking for that special something extra to make your Renaissance outfit complete, think about how a hooded cloak would look on top of your period garb. Hooded capes and cloaks add a striking visual effect to any period outfit you wear. For a stunning look that will immediately draw every eye, there is the Taffeta Lace Cloak for women or men! The deep burgundy color and shimmery texture work as well for a wicked queen as they do for a fair maiden…or a confident, charming man of romance. For a valiant look that adds drama to a costume, consider a Reversible Cloak. Use the black side when you want to add mystery or slip by unseen, and reverse it to purple for a dash of bright, eye-catching, royal color! Mystery and intrigue abound when your costume is dark and alluring. Add that intrigue to your costume with the Magic Mist Cloak. The sheer, flowing fabric is perfect for a mage, witch, elf, or anyone who wishes to cast a glorious spell on all who see them. Medieval cloaks are especially appropriate during the chillier months of the year. While some people limit their involvement in Renaissance activities to the summer faire and theater season, others continue to enjoy this interest throughout the year. Cloaks are fantastic alternatives to winter coats, and excellent for wearing to Renaissance events being held after the summer festivals conclude. You can opt for our opulent, grandly-styled cloaks for more thematic events, or subtler, simpler designs that offer the same level of quality, but are more suited to keeping warm throughout the winter and being worn outdoors on varied terrain. Seasonal events of winter may also be perfect for dressing in Renaissance wear, and Medieval cloaks can keep you warm in the process. A Father Christmas figure, for example, would look wonderful with a richly colored cloak. Participants in thematic villages and displays for the holidays might find Renaissance garb and cloaks to be excellent apparel choices. Surprise your literature students or classmates by dressing in thematic apparel for a unit on Shakespeare! If you are planning an early spring Renaissance event for your school, the weather will still be such that warm apparel is necessary, and a cloak is the perfect choice for staying comfortable. Of course, the use of a cloak isn’t limited to cold weather. It’s just fun to be able to continue enjoying your interests no matter how sharp the chill in the air! 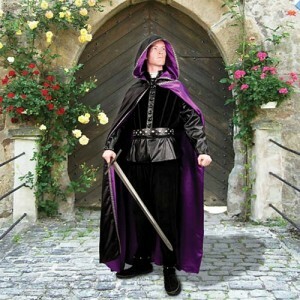 Get the Perfect LARP Costume!